Hello, my name is Mike Jones and I write for the Tattoo Blog website. I’ve recently read your op-ed piece Is It Just Me With A Tattoo Taboo?, at the Wales Online website and I have to say that I’m more than a little disappointed. As someone who has written rather extensively on tattoo (both online and in print), I’ve read more than my fair share of anti-tattoo op-eds. They never cease to intrigue me, for the simple reason that I’ve never quite been able to grasp the reasoning behind the argument that tattoos aren’t good for people, society and the status-quo in general. I cannot for the life of me comprehend why anyone cares what anyone else does with their body. That being said, your dislike of tattoos isn’t the reason why I was disappointed with your piece. After all, you are entitled to your own opinion of tattoo just as I am entitled to be tattooed should I choose to do so. The reason for my disappointment, Mr Henry, is that I’ve grown tired of the trite and frankly just plain dull arguments employed against tattoo. Perhaps foolishly, I still cling to the hope that one day when I read an anti-tattoo op-ed it will surprise me with an all new argument against the art of tattoo that will really make me think about this particular stance in a new and far more interesting light. 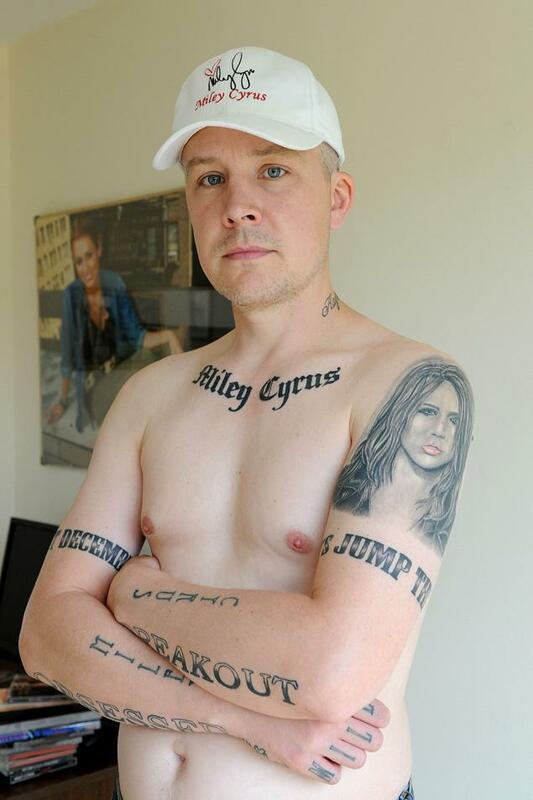 The bulk of your piece (and argument) centres around Carl McCoid, a 40 year-old man who recently had a large tattoo of pop-star Miley Cyrus done. You wield this tawdry fact as though it were entirely representative of the 29% of young adults in the UK who are tattooed. I’d be more than willing to wager that Carl McCoid’s tattoo is not at all typical of the sort of tattoos found on young adults. The very reason that you or any other media source are reporting on it is precisely because it’s a blatantly unusual choice of tattoo for a 40 year-old man. By focussing the issue of tattoo on this rather frivolous and just plain creepy example, you pigeonhole the tattooed into an association of socially irresponsible fools who are incapable of making sound decisions as functioning adults. Moving along, you point to the difficulty in finding suitable work in this troubled economy and that employers’ attitudes toward tattoos remains overwhelmingly negative. What exactly are we to do with this piece of information, Mr Henry? Are we to assume (as you apparently do) that the unemployed are all tattooed? Aside from being an archaic theory based entirely on conjecture, I’ll also remind you that tattoos are not cheap and that if one plans to get tattooed, one is most likely employed. You reference several celebrities and their seemingly endless collections of tattoos. Did it occur to you that the reason celebrities have so many tattoos is because they can afford them? Sure, the argument can be made that anyone can have a friend or grimy acquaintance give them a tattoo in a basement somewhere with equipment bought off the internet. At the same turn, the argument could also be made that anyone is capable of making dirt cheap alcohol in their home if they so desired. The fact that it’s possible does in no way mean that the majority of people who enjoy a tipple now and again are ladling it directly from their bathtubs. Or are you suggesting that those who are unemployed will remain unemployed if they happen to be tattooed? University degrees and technical savvy be damned should anyone be foolish enough to commit the mortal sin of permanently imbedding ink into their own flesh, I guess. You also wonder if Mr McCoid will still feel the same way about his Miley Cyrus tattoo when he enters into his senior years. Ah yes, the good old Tattoos-Will-Look-Terrible-When-You-Age argument. This argument has most likely existed just as long as tattoo itself has. It’s a weak and entirely absurdist point of view that somehow has managed to play itself off as a legitimate gripe for decades. Let me ask you this, Mr Henry: when was the last time that you heard anyone, anywhere condemn or criticise the stylistic choices of the elderly? Better still, when was the last time that you heard anyone, anywhere condemn the elderly – full stop? Rarely, if ever, does it happen. My goodness, even Nazi war criminals are spared prison terms due to their advanced age. Society in general tends to utterly ignore the actions and choices made by the elderly within their lifetimes, let alone their personal style. To argue that a tattoo will bring regret to one’s geriatric years is a moot point if ever there was one. None of us can say with certainty that we’ll be here tomorrow, let alone 30, 40 or 50 years down the line. Obviously, tattoo regret exists and is very real for some people. But not all people are frivolous in their decision making process when it comes to getting tattooed. That concept in itself seems to continually escape critics of tattoo such as yourself. Belief in such a concept is symptomatic of a narrow frame of reference. Tattoo can help people to gain closure on the death of a loved one, immortalise pivotal moments in their lives or even to start over, as is the case with some breast cancer survivors who use tattoo as a means to cover up mastectomy scars and regain their confidence. The point, Mr Henry, is that you and I both might agree that Carl McCoid’s Miley Cyrus tattoo is ridiculous. And we both might be right. But your assumption that people who get tattooed do so because they are unhappy or dissatisfied with the way they look is wholly naive at best and entirely ignorant at worst. No one can claim to fully comprehend the reasoning behind anyone’s tattoo except the person who has chosen that particular tattoo. Sometimes that decision turns to regret three or four years down the road, yes. But the fact remains that people will continue to get tattooed. It isn’t going to go away. If a tattoo makes someone happy for even 3 or 4 years – regardless of how moronic you or I might find it to be, then who are we to judge? If there’s one thing this world needs it’s an increase in happy people. Whether a tattoo brings that happiness for a short or lengthy period of time is irrelevant. You would do well to take the time and look into tattoo more, there’s an entire world out there of stunning artistic achievement. Perhaps then you’d see more than just some foolish trend doodled on to the bodies of the people around you.